How do you have a vastly unsustainable 100 million sharks a year being slaughtered, yet USA Today telling its readers “it’s all good”? 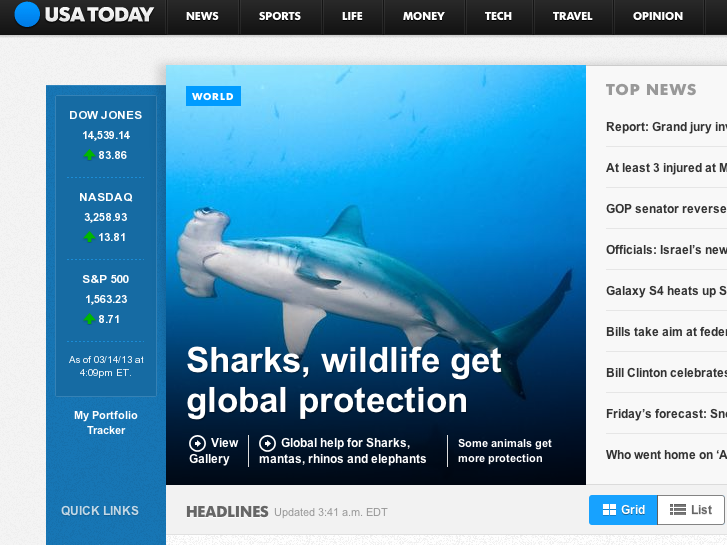 To the uninformed reader, this headline says one simple thing — sharks just got “global protection.” Plain and simple. And not true. DON’T WORRY, BE HAPPY! Nice job with the messaging. Here’s the nation’s second largest newspaper sending out the word this morning that sharks are all set now as they “get global protection.” Whew. I guess there’s no problem with them after all. Time to close up all the major shark conservation groups and move on to protecting barnacles. The article accompanying the headline fills in the details — that CITES voted to protect 5 species somewhere, somehow, while the article even mentions the 100 million sharks harvested annually. The proper headline should be “Sharks Still Getting Screwed.” And btw, in today’s rapid world, headlines are about all that matter for broad communication. How can there be all the MASSIVE conservation groups with the massive budgets and massive teams of communications “experts,” yet this is what appears in the nation’s second largest newspaper? It’s the sort of bungling of conservation communication that has gone on for over a decade. Yes, I know what the communications people will say, “It’s the media’s fault, we can’t help it.” You won’t hear Hollywood publicists saying that when the headlines come out about their clients. The good ones know how to make sure the headlines match what their client wants. There are ways to achieve that, but only if you’re good at it.